It was just a plain wall that never looked dressed up no matter what picture I hung there. My home is a very small size three bedroom home, where living and dining room share the big room with designated sides that we call "Area". 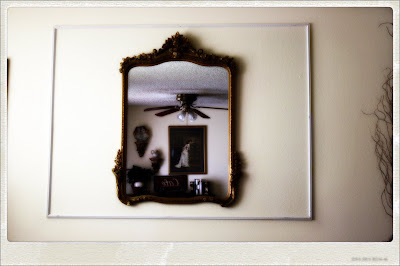 My brother Carlos had given me the trim he no longer needed and I used it to trim this mirror I picked up at a yard sale for 25.00. The room looks larger because of the mirror, yet it still seems unfinished. I am on the look-out for antique Limoges plates to put on each side. I have seen several plates but it has not drawn me to purchase any. Once I find the right plates I will add a new picture to share with you.